I'm on the twill chapter in the Chandler book....just wound the first warp for that. And I've got huck towels on my Baby Wolf....I finally got started weaving after trying to de-mystify draw-in. Good luck getting the loom set up, and have a good weekend! The yarns look so enticing - lovely! 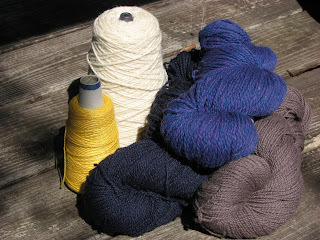 and much easier/more fun to learn with colours and fibres that excite you. Good idea about baby steps, nothing worse than pushing too hard and fast and just getting stuck. Yay loot! The colours will be lovely together. I do like the measured approach you're taking.